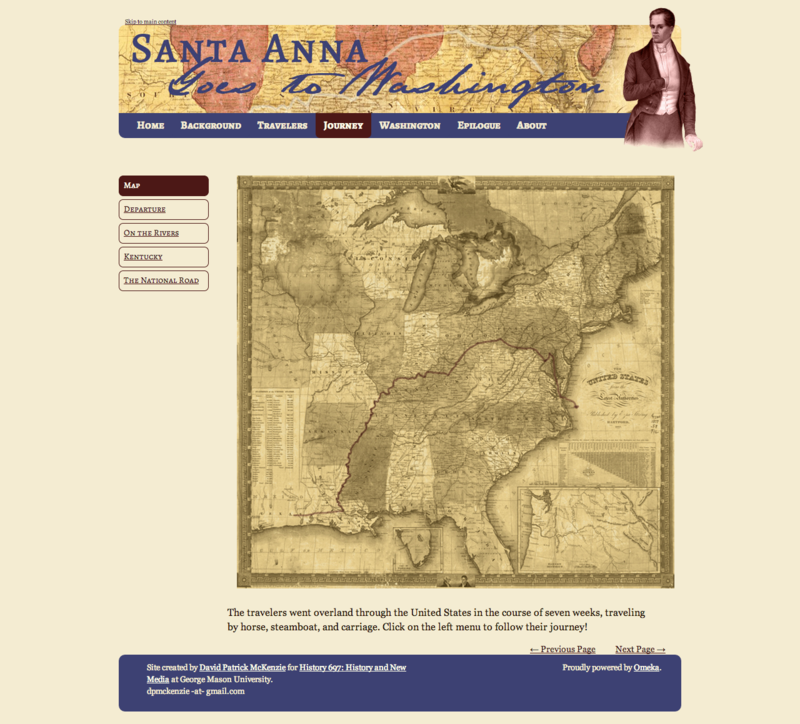 For my Clio 2 website in spring 2012, I drew their route on an 1837 map of the United States. I planned to add interactivity to the map, but ran out of time for the project. Also, the map was not geolocated at all–it was just a static map. For Clio 3, I used the journey to learn basic mapping software that is available online. I used Laura O’Hara’s tutorial (not available online at the moment). First I created a basic spreadsheet of the places cited in Almonte’s diary, then fed that into BatchGeo, an engine that spits out latitude/longitude and a KML file. I then fed that KML file into Google Maps. I also used MapWarper to place my 1837 map as the background. While I wasn’t happy with some of the automatic locations, I was able to move them to roughly the right places. I embedded the map on this webpage, but ran into trouble when I tried to embed it in my Omeka site. That map represented a good start, but I was looking for a more precise map, one that could depict the journey and not just points. Like Jordan, I used Google Map Engine Lite Beta. I could have gone through the steps that I did for the Clio 3 version, with a full KML file and such, but wanted to see how this software worked for me. It seems to have done the job. To get the locations where the travelers stopped, I relied a great deal on a Southwestern Historical Quarterly article by the late, lamented Dr. Margaret Swett Henson. Henson annotated Almonte’s diary as an appendix to her article about the treatment of Mexican prisoners of war held in Texas following its 1836 war of independence. The diary itself contains only basic information, such as where the travelers stopped each night. Henson tracked down many of these locations. I used Dr. Henson’s descriptions, cross-referencing other geographic sources, to plot precise locations on my map. I found the rough locations that I wanted to use in Google Maps, then right-clicked (a trick I learned after the first few places!) to get the exact latitude and longitude. I corresponded those with the dates in a Google Docs spreadsheet. I also felt that including Almonte’s diary entries, Henson’s analysis, and my notes where appropriate would enhance the user’s experience with the map, so I put each into the spreadsheet. Finally, I ran the map engine with the spreadsheet, and voila, I got clickable dots for each day! But because I am obsessive, that was not enough for me. Some of my surmising of imprecise locations came from combining Almonte’s distance calculations, Henson’s knowledge of what routes they took, and my comparisons to 1837 maps. As such, I wanted to be able to show not just the dots, but the route the travelers took. Thankfully, I discovered that Google Maps Engine also offers the option of drawing on the map. Some parts were easy, such as the Mississippi and Ohio rivers or the National Road. Other parts were more difficult, such as figuring out the routes the travelers took through East Texas, so I had to guess or just draw straight lines. So in the end, I produced a map that shows the places that Almonte mentioned, as well as the route they took. There’s still more that I could do with this (and indeed may). For some parts I felt a great deal of certainty–e.g., where I could find an exact location for the hotel where they stayed–while in many other parts I chose a central spot within a town. I may go back and depict the certain and uncertain locations in different colors. Also, I may add more links to external information. And finally, I need to figure out how to handle multiple dots in the same spot. In the end, this exercise helped me think about this journey in different ways. I started researching this journey off and on in 2009 (research that helped lead me back to graduate school). Looking more closely at the map gave me ideas of new sources, such as local newspapers from towns along the way. I also gained a greater understanding of the topography, especially through using Google Street View. In the future, I may try to embed this map in my updated Omeka site (once I get around to customizing the theme for Omeka 2.0). I may, though, instead try Neatline, as it seems that will help me depict the space in time all the better. Have others used Neatline for these purposes? What have been your experiences? Dave, fantastic work! I’m glad you picked this map back up and it’s so nice to see your progress!